The Government Finance Officers Association of the United States and Canada (GFOA) presented a Distinguished Budget Presentation Award for its annual budget for the fiscal year beginning July 1, 2017. The California Society of Municipal Finance Offices presented its certificate of aware for Operating Budget Excellence to the Otay Water District for fiscal year 2017/2018. 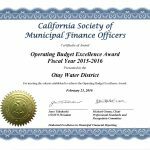 The California Society of Municipal Finance Officers presented its certificate of award for Capital Budget Excellence to the Otay Water District for fiscal year 2017/2018. The District’s Information Technology group received the Municipal Information Systems Association of California’s (MISAC) achievement award for “Quality Information Technology Practices” for 2017. The MISAC award program recognizes public agency Information Technology groups throughout California for their exemplary technology service and operational practices and standards. The selection process evaluated several different subject areas to include enterprise technology operations, project management, system deployment, disaster recovery, and cybersecurity practices, all of which were a collaborative effort by the District’s IT group. 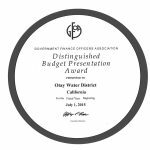 The Government Finance Officers Association of the United States and Canada (GFOA) presented a Distinguished Budget Presentation Award for its annual budget for the fiscal year beginning July 1, 2016. The California Society of Municipal Finance Offices presented its certificate of aware for Operating Budget Excellence to the Otay Water District for fiscal year 2016/2017. The California Society of Municipal Finance Officers presented its certificate of award for Capital Budget Excellence to the Otay Water District for fiscal year 2016/2017. 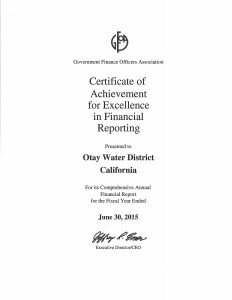 The Government Finance Officers Association of the United States and Canada (GFOA) presented Otay Water District with a Certificate of Achievement for Excellence in Financial Reporting for the District’s Comprehensive Annual Financial Report for the fiscal year ended June 30, 2017. The Government Finance Officers Association of the United States and Canada (GFOA) presented a Distinguished Budget Presentation Award for its annual budget for the fiscal year beginning July 1, 2015. The California Society of Municipal Finance Offices presented its certificate of aware for Operating Budget Excellence to the Otay Water District for fiscal year 2015/2016. 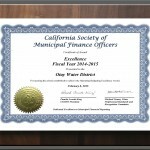 The California Society of Municipal Finance Officers presented its certificate of award for Capital Budget Excellence to the Otay Water District for fiscal year 2015/2016. 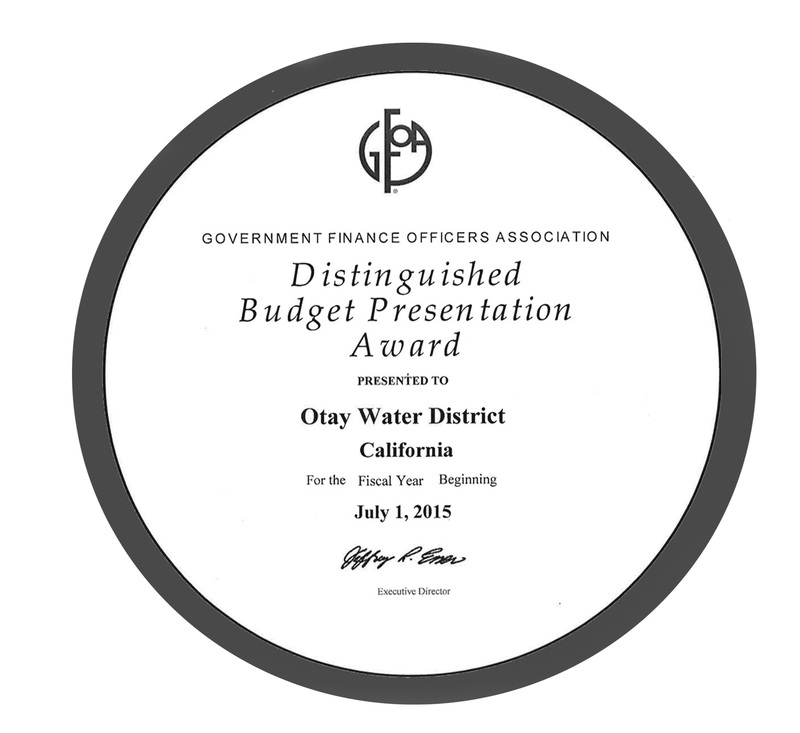 The Government Finance Officers Association of the United States and Canada (GFOA) presented Otay Water District with a Certificate of Achievement for Excellence in Financial Reporting for the District’s Comprehensive Annual Financial Report for the fiscal year ended June 30, 2016. 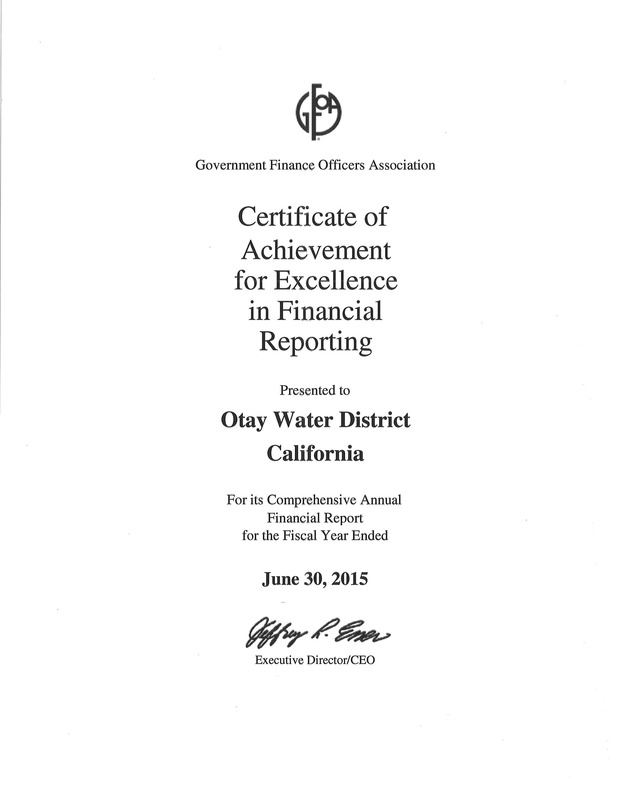 For the 12th consecutive year, a Certificate of Achievement for Excellence in Financial Reporting was awarded by the Government Finance Officers Association to the Otay Water District for the CAFR for the fiscal year ended June 30, 2015. This is the highest form of recognition in governmental accounting and financial reporting. Its attainment is recognized in the industry as a significant accomplishment by a government agency and its management. 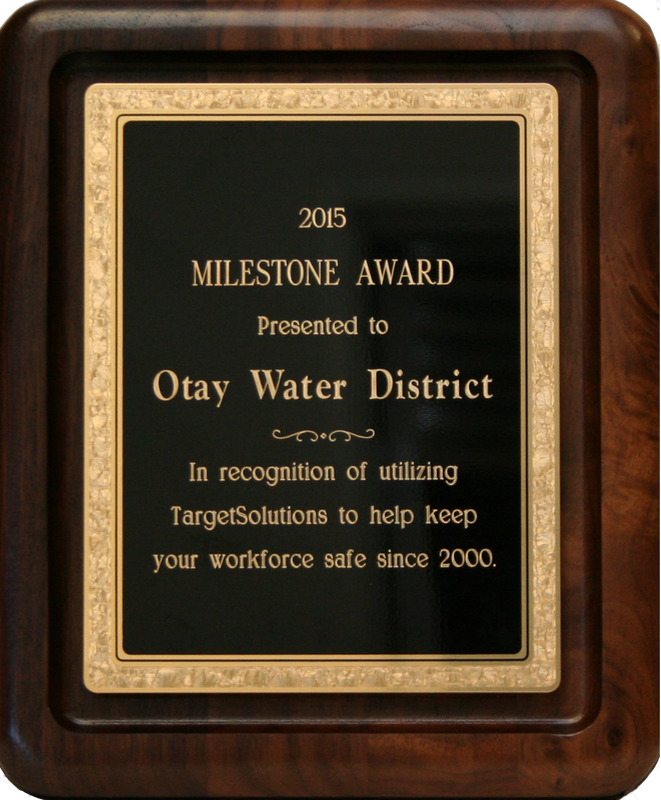 TargetSolutions presented its “2015 Milestone Award” to the Otay Water District for using this training program to help keep employees safe since 2000. The Government Finance Officers Association of the United States and Canada (GFOA) presented a Distinguished Budget Presentation Award for its annual budget for the fiscal year beginning July 1, 2014. 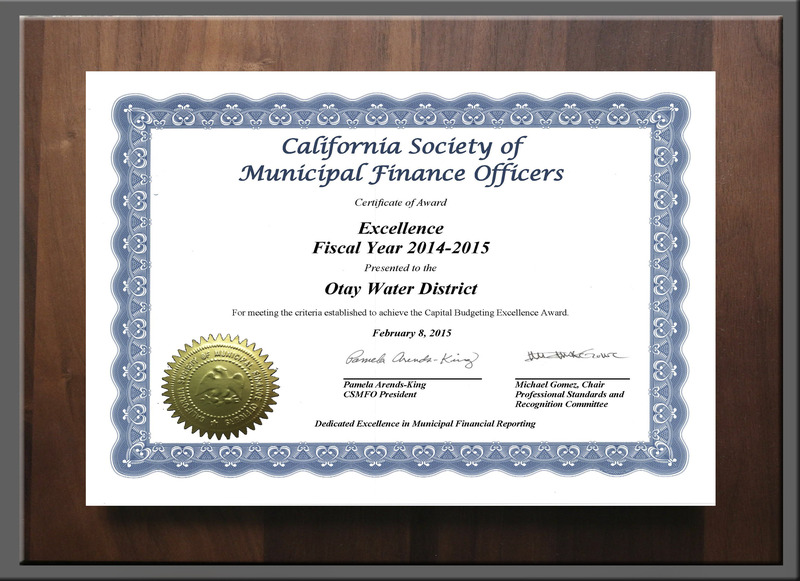 The California Society of Municipal Finance Officers presented its certificate of award for Capital Budget Excellence to the Otay Water District for fiscal year 2014/2015. 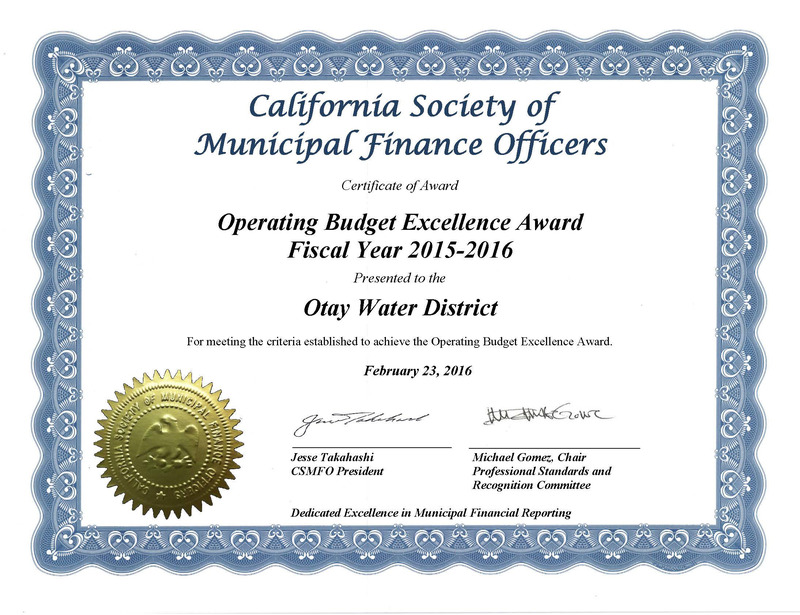 The California Society of Municipal Finance Officers presented its certificate of award for Operating Budget Excellence to the Otay Water District for fiscal year 2014/2015.